Remember those science projects we all used to do every year in elementary school for the Science Fair? You know, the ones where you would have to conduct an experiment of some sort and then buy those foldable cardboard display board with the wavy borders to show your hypothesis, procedures, results, data and all the other portions of the scientific process? I don’t remember much, but I do remember my favorite projects revolved around plants -- not because I had any sort of affinity for plants, but mostly because they were the easiest projects to do. Don’t judge! I was never the crafty type and building a scale model of the solar system or a volcano just didn’t seem worth the effort. Plus, plants don’t run away or explode. Anyways, one year I decided to plant different types of seeds to see which ones would grow faster. These projects required time and patience. I'd plant them in the same type of soil, give them all the same amount of water and exposure to light and let them do their thing. Some of the seeds grew quickly, others wouldn't -- at least not right away. If I decided then and there to dig up the seeds to try and see what the problem was, I’d disrupt the process. I would undo all the progress being made underneath the surface and have to start over. All because I didn't have faith in the process of plant growth. The same often applies with the things we plant in faith in our lives. I may not be a overalls-wearing, pitchfork-wielding farmer, but in a way we’re all spiritual farmers, planting seeds of faith in prayer and hoping for a harvest somewhere down the line. We have dreams for different areas of our lives and we sow seeds in our relationships, in our finances, in our churches, in our careers… and then we hope that those tiny seeds of faith turn into a crop of healthy marriages, strong families, successful businesses, enriching friendships and fruitful ministries. Usually, the problems occur in between the sowing and the reaping. It’s making sure our seeds are getting the right amount of water and sunlight and protecting our seeds from the weeds, birds and insects that threaten to sabotage growth. Most importantly, though, it’s figuring out when to just stay out of the way and let God do the work. It’s practicing patience and not compromising everything we’ve planted by uprooting the seeds we plant before they bloom. When we want everything to happen on our own timetable, we end up digging instead of reaping. I’ve been staring at a couple of empty fields lately that I hoped would have been yielding some kind of results by now and I’m wondering if I’ll ever see a crop show up. 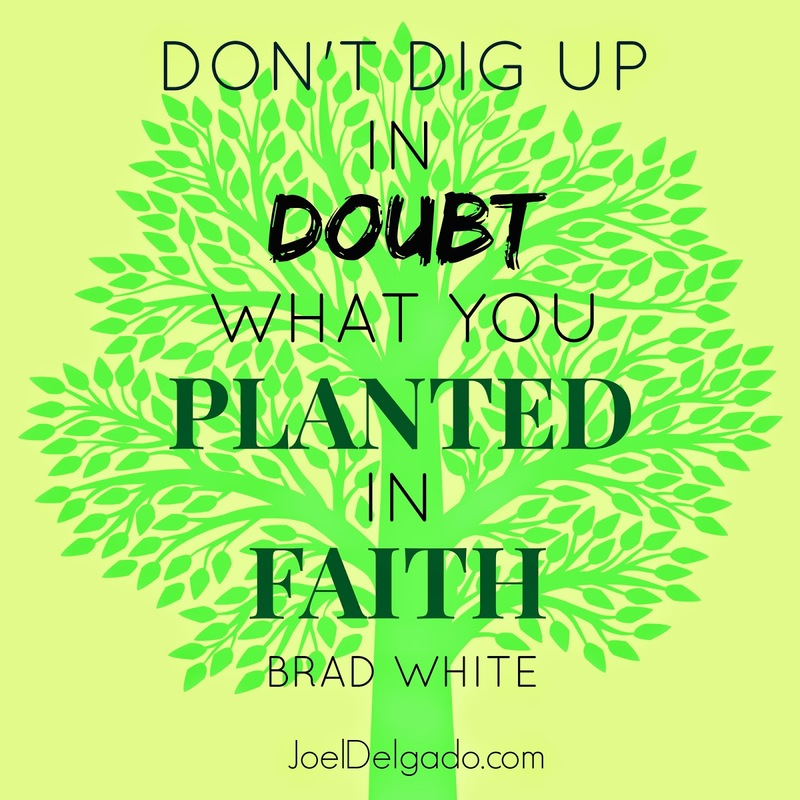 I’m tempted to dig up in doubt what I planted in faith. Maybe you are, too. Don’t do it. Don’t bail out before the breakthrough. Don’t let doubt uproot your faith. Don’t let impatience override your trust in God and in the process. Stay the course. Stay committed. Stand firm. Keep sowing. Keep tending your fields.